To enter to win Mini Scenery: Into the Woods + Scenery: Big Bang Flurries + Winter Woodland continue reading! We are celebrating winter in all its natural beauty today with our stamp sets: Mini Scenery: Into the Woods; Scenery: Big Bang Flurries and Winter Woodland. These sets may have a winter cast they are still delightful all year long! 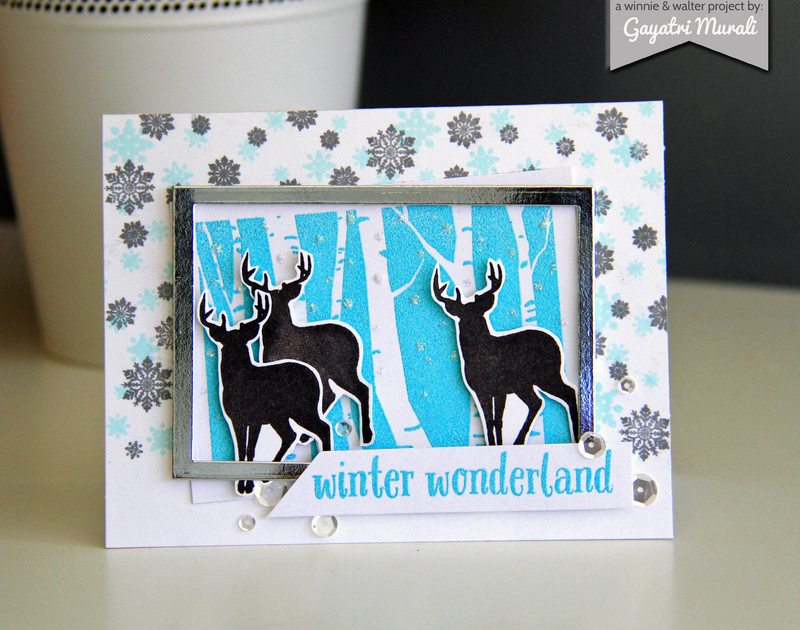 Wait until you see the wonder of Winter Woodland that is divine for masculine cards as well! We’re so glad you are back for more w&w goodies! Today, my cards are in the great outdoors, and both at night. Did I mention how much I love a pretty navy blue? Well, today I’m using shades of Broken China, Faded Jeans, Chipped Sapphire *sigh* and Lapis Blue (an Ancient Page color close to sapphire). In my Christmas card past, I was intrigued with the one layer cards that were popular where you stamp and emboss an image in white, and then you color around it to make it pop! I just had to try it with our new giant pine tree from Winter Woodland. On this card, I really wanted to showcase the Mini Scenery: Into the Woods, but opted to use the Digital Elements version that is already sized perfectly for a 4.25 x 5.5 card. I just opened the png file in my Silhouette cutting software and let it do all of the work. Gotta love it! The cut piece has strips of foam tape underneath to give it added dimension over another blue inked panel. This time, I have Wink of Stella brushed at the top, and then I used a wet paint brush and pulled the sparkle from the top to the bottom to cast a subtle shimmer to the background. The sentiment from Winter Woodland is stamped and embossed on a strip of vellum and adhered to the die cut. Last but not least, I have the stag stamped on its coordinating Digital Element precut stamp shape rather than doing a fussy cut. Yea! I hope you are ready to be blown away with today’s inspiration. Shay, the Talent and our special guests have some fabulous projects to share. Keep on scrolling! Wow, Julie's beautiful cards are enchanting! Navy is one of my favorites for any time of year and especially for the holidays! I went with both non traditional and traditional color schemes with my cards. I am really thrilled with these 3x4 Mini Scenery stamp sets. They can be used as backgrounds, focal points on a card, on tags, in scrapbooking and pocket memory keeping to name a few things. I stamped the Mini Scenery: Into the Woods in black on a piece of grey cardstock and then pulled out my...white crayon. People I have boxes of crayons (the big ones) as they were my friends growing up (don't tell anyone but I have coloring books too) and I still use them on occasion. I colored in the bark of the tree and around the image with the white crayon. Next I stamped one of the blocks of flurries from Scenery: Big Bang Flurry around the top of the panel in Versamark. 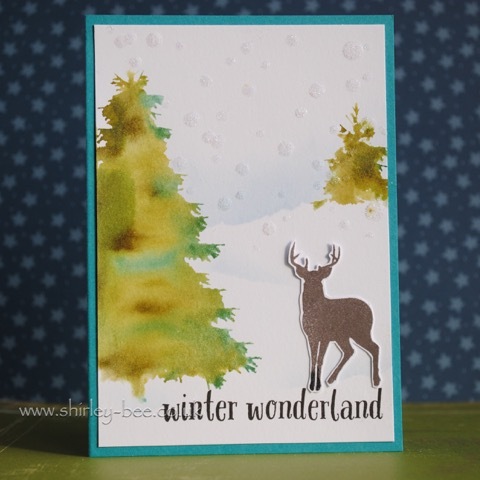 I also stamped the smallest matching flurry over the trees in Versamark and heat embossed it in white. 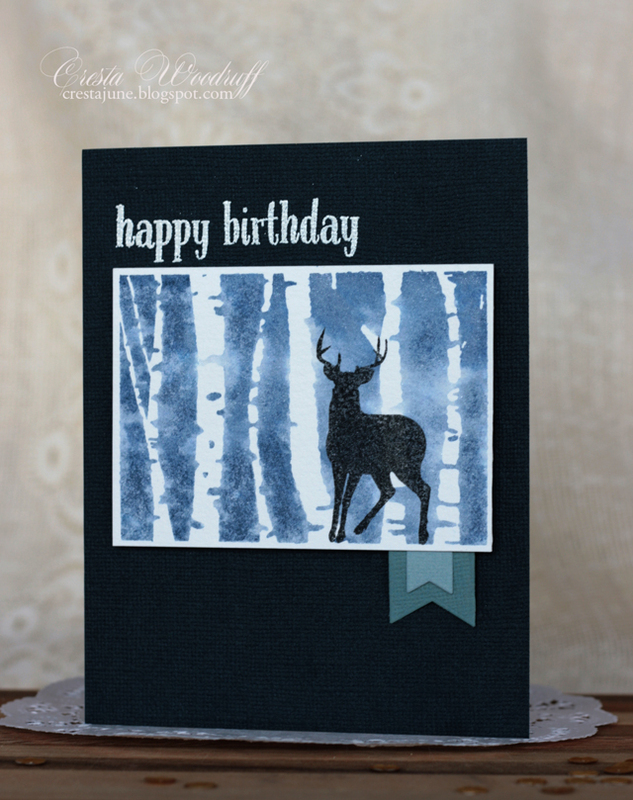 I stamped the sentiment from Winter Woodland in Versamark and heat embossed it in white. You will note I used crayon and then heat embossed so there was obviously a little melting happening so I went over the trees a bit more with the crayon. I stamped the plump cute cardinal from Winter Woodland in fired brick Tim Holtz Distress Ink by Ranger on watercolor paper and cut it out and attached it to the panel. 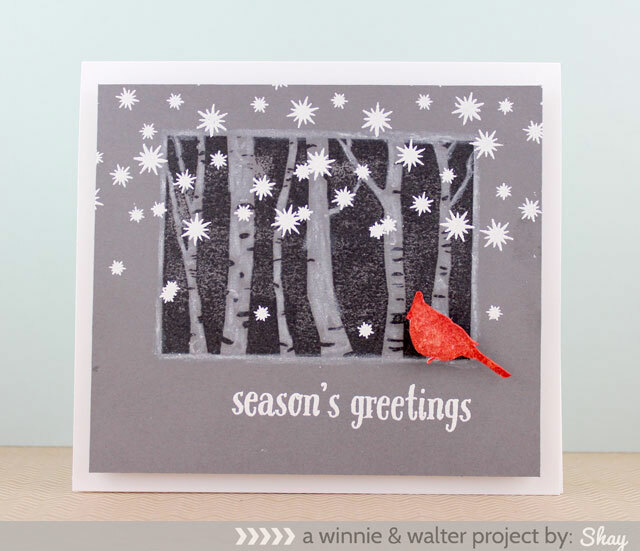 My next card is all about Winter Woodland...what a stamp set! 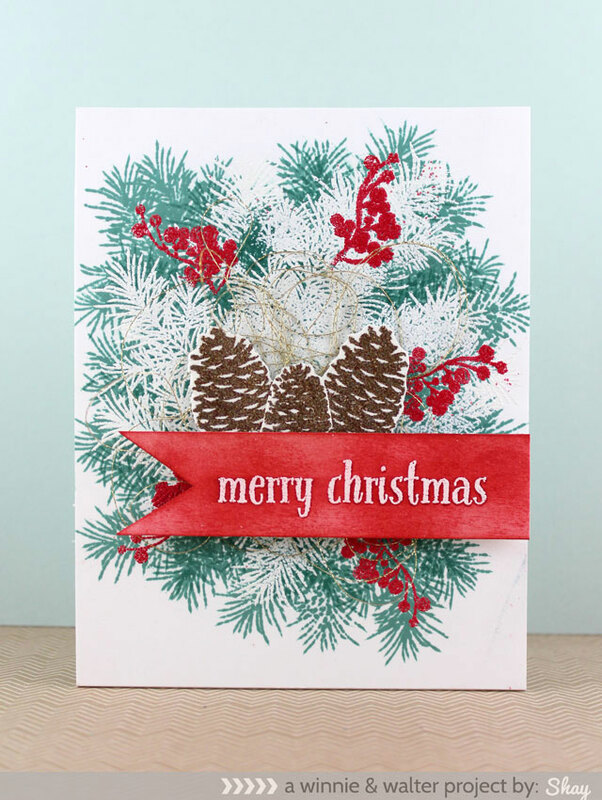 I stamped the pine around and around in evergreen bough (perfect color!) Tim Holtz Distress Ink by Ranger, I then overstamped with the pine stamp in Versamark and heat embossed in white. 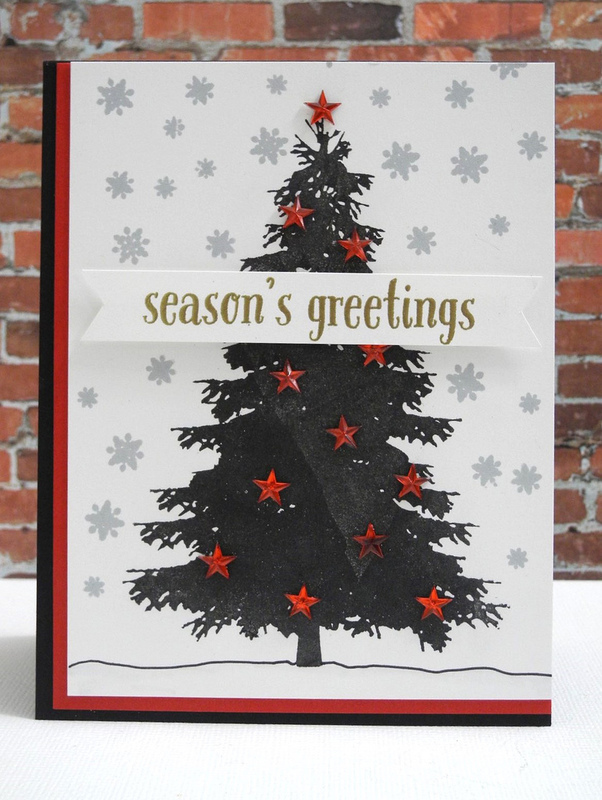 I filled in some more space with the evergreen bough with the pine stamp. Then I stamped the berries in Versamark and heat embossed it with rouge Zing! embossing powder. I stamped the large pine cone twice and the little pine cone once with Versamark and embossed it with bronze embossing powder and then cut them out. Before adhering the pine cones I added a nest of gold thread. 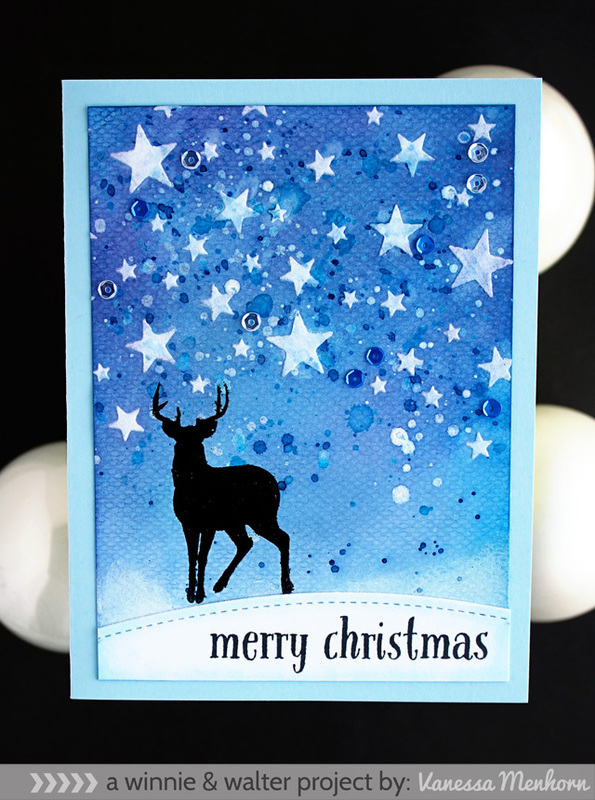 On a strip of white card stock with a tail cut out on one end, I stamped "merry christmas" from Winter Woodland in white embossing powder and then I colored in the banner with festive berries Tim Holtz Distress Ink by Ranger. I attached the banner with foam dimensional adhesive. Now, you will not want to miss the delightful projects by our guest stars and The Talent! 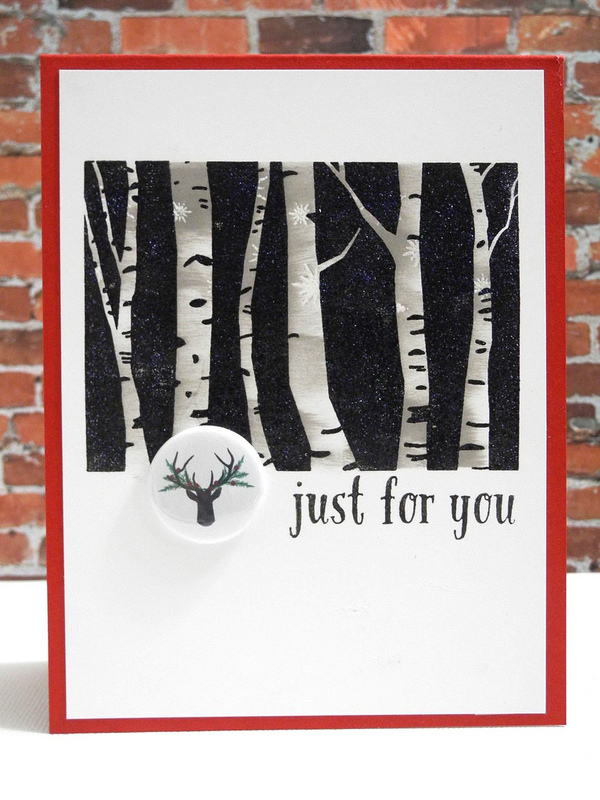 Comment here on this post for a chance to win Mini Scenery: Into the Woods stamp set + Scenery: Big Bang Flurries stamp set + Winter Woodland stamp set of your own by 11:59 p.m. (central standard time) October 31, 2014. One comment will be chosen at random. Gorgeous new stamps and wonderful inspiration! WOW - there is a WORLD OF WONDERFUL here today!!! HOLY SMOKES!! That is a LOT of inspiration!! I had to look through it twice, to soak it all in!! Winter Woodland just shot to the top of my wish list!! What amazing creativity on these cards! So excited about this new release! What an amazing lineup. I'm in love with that deer. A gallery of gorgeous here; every card a unique showcase of your amazing new release. Swooning over these wintry woodland images...fabulous and so versatile! Thank your for all the inspiration! A LOT of amazing inspiration! A big thank you to all the super talented Ladies! Wow! there are some fabulous examples there!! TFS!! WOW! These cards are just stunningly beautiful! Love the new stamps and screenings. Thanks for all of the inspiration. Wonderful cards today! I can't wait to see the full reveal. The men in the family spend a lot of time in the woods so there are a several great dies and stamps that I'll need for their cards. 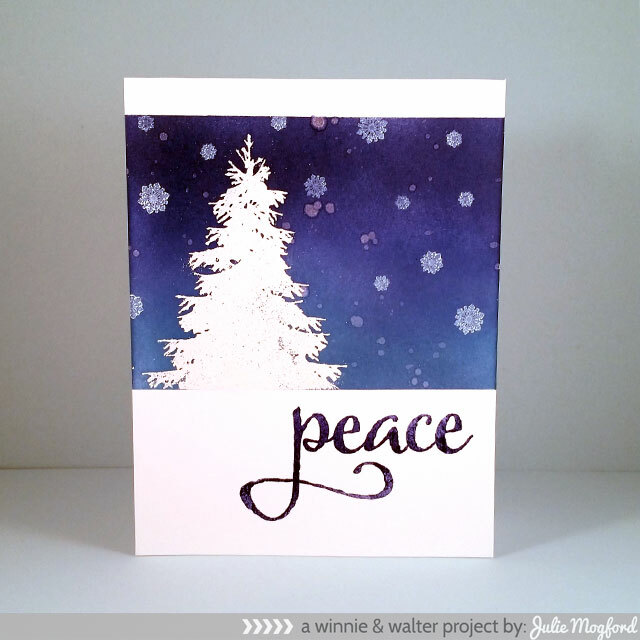 I loved that first card with the white tree on the dark blue background. It is beautiful. All of the cards are great. Amazing cards from the design team. Love the deer stamp alot! Fabulous projects today! 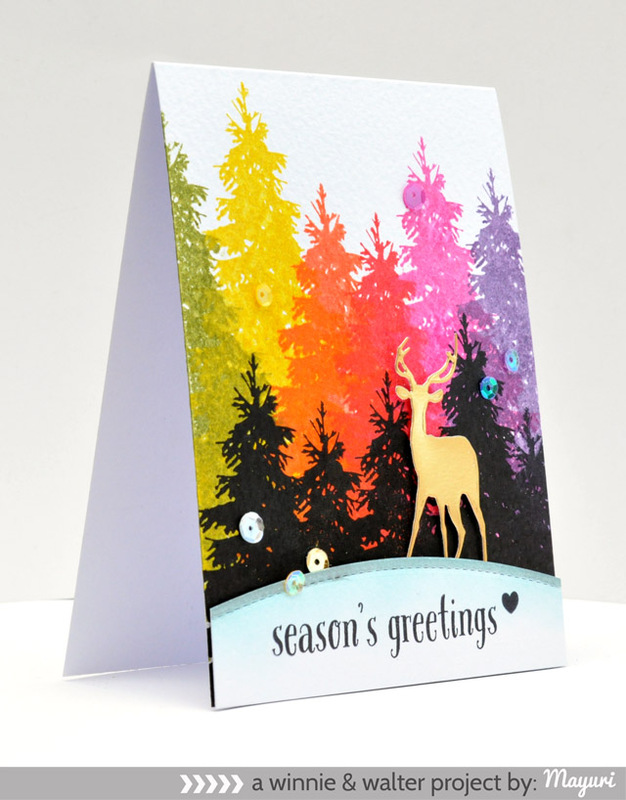 I love Mayuri's rainbow trees, so very fun! Wow! What a gorgeous collection of cards and talent. These are just fabulous! Awesome stamps and gorgeous examples by the team amazing cards love them all. Thanks for the chance to win. Wow what wonderful and creative projects! Really lovely cards and the stamp set is my favvv, the birch trees and the deer and the christmas tree :D hands down winner! These images are gorgeous - the tree is so lush! I know what I'm spending the last release's winnings on! I am so excited about these stamps! They are GORGEOUS!!!! Such great stamps...really like this woodland theme. those trees are just gorgeous! Loving the tree background, but that log cross section I think is my very favorite thing about today! Great sets! I love everything that I'm seeing so far. Can't wait until Friday! I can't tell you which card I like the best! You're presenting such amazing work! The trees look awesome! I love the look of stamping the trees close to each other. Thanks for the chance to win. What great inspiration!!!! Just amazing! Thanks for the opportunity!! WOW!!!! The team rock!!! All of them are amazing and gorgeous artworks. I love this sets! Great ideas. Love the tree! Love that deer silhouette!! Great job by the awesome team!!! Great cards!! I love those trees!!! Fabulous cards! So many ideas for these great stamps! beautiful stamps... gorgeous christmas cards... love them all... the tree is so beautiful.. so is the cardinal..
Gorgeous cards! Love how unique each one is!! It's amazing how many different looks can be achieved with the same stamp sets! Oh wow! These cards are beyond fabulous!!! Such a wonderful variety & so much inspiration. Fabulous!!! LOVE all the DT cards and this release is gorgeous! Beautiful work! TFS! What wonderful new sets! I really like all the showcased projects. Calling the DT the talent is a huge understatement. What a group of fabulous artists! I love the new images and the girls realy showed them off so creatively and spectacularly. What amazing projects!! I can't wait to get the new release! These cards are stunning! New release looks awesome!! Simply amazing cards! Love the different looks! Such inspiration!! Wow! These cards are all so amazing! The different styles and techniques really emphasize the possibilities with these stamp sets. Beautiful release! Oh my goodness! These samples are gorgeous! So many cool techniques and fun new products!!! I love all these beautiful winter scenes! These sets are getting better and better and can't wait for them to be on sale!!! Bet they will all go like hot cakes! I adore the dear. Wonderful inspiration. These are absolutely fabulous projects! Excuse me while I go pick up my socks from across the room, 'cause you girls knocked them clean off! Completely amazing. 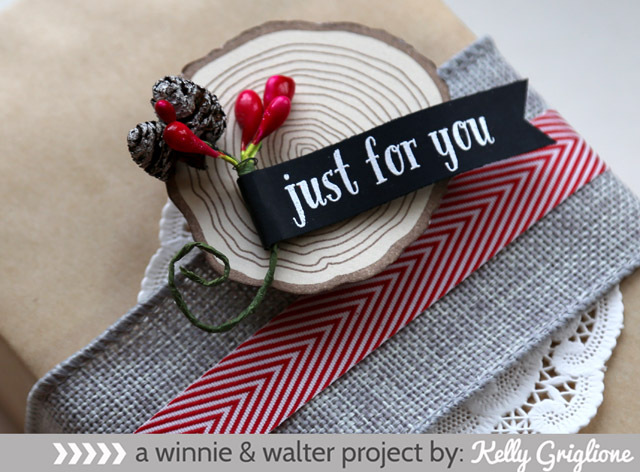 I don't have any Winnie & Walter stamps yet but I would sure LOVE to give these a try! Gorgeous cards! I can't wait to see the new release!! Counting down the days impatiently!!! This set speaks to my Nature loving soul! Glorious creations and I just HAVE TO GET THESE!!! Very drool worthy in my opinion! TFS! Wow, these new stamps are just amazing! As are all the fabulous samples! Thank you so much for the great work and inspiration! Love this stamp set. The projects the team made are fabulous. Wow! Amazing cards featuring gorgeous stamps! Very excited about this release! Oh, my goodness! How many awesome products can be in one release? I am never going to be able to get all that I want - Cuz I need it all! Bravo! Gorgeous cards! 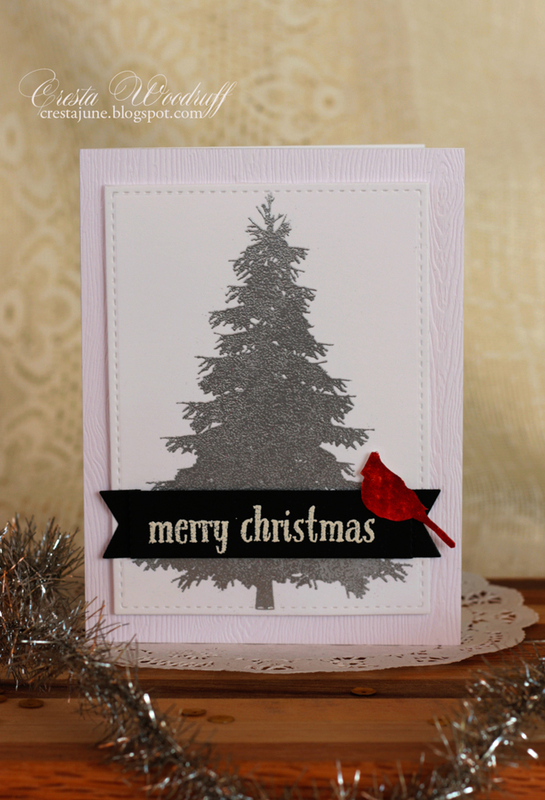 That giant pine tree stamp is absolutely beautiful! Oh wow! I love this big tree and that deer! Fabulous! Soooooo loving this release!! That wood grain image is so unique..love it!! My wishlist is growing longer and longer everyday. Amazing cards, love all the stamps!! This may be the coolest release yet! Wonderful projects with these sets! Wow, I love all these cards. Great stamps! OH my gosh! 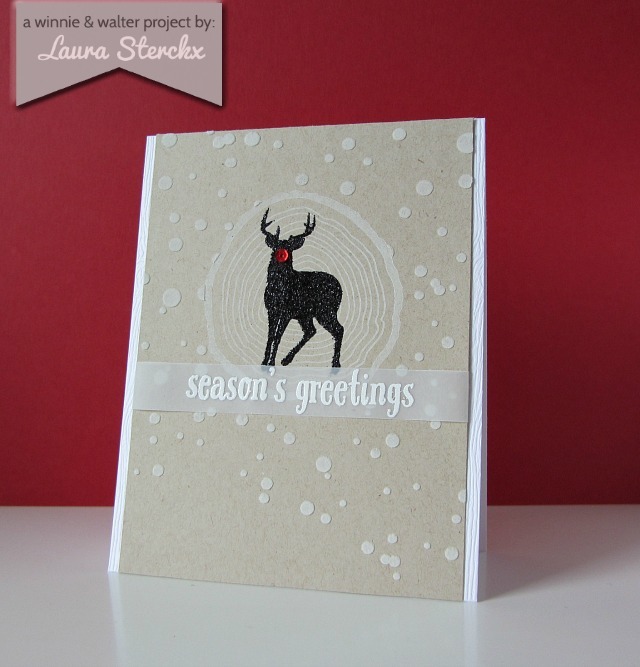 I'm stunned at all these FABULOUS cards/projects! I'd LOVE to win these!! Mind blowing. What a great job, Designers! Seriously wonderful. wow - these are all stunning. Your group of artists are amazing. Wow what beautiful Cards! Very creative! Love the release! Gorgeous cards. I love that the stamp sets have been used for wonderfully traditional and fabulous fun and modern designs as well. These stamps look amazing I can't wait to see the full sets. Wow !! what a beautiful line up of cards ..Each and every one is just so amazing ! I'm looking at these cards in reverse order. Love the big Christmas tree stamp - the design team have excelled themselves! Great work. I love these samples! Those birch trees are gorgeous! Beautiful images and card. Love the woodland pieces. The deer is awesome! One right after another, glorious, fabulous, non-tradish colors that just warm my heart!! How wonderful... can't wait for this release!! I love this theme. The design team created beautiful projects with the products. I'm looking forward to using them too! I am loving all the ways these stamps can be combined for different looks! 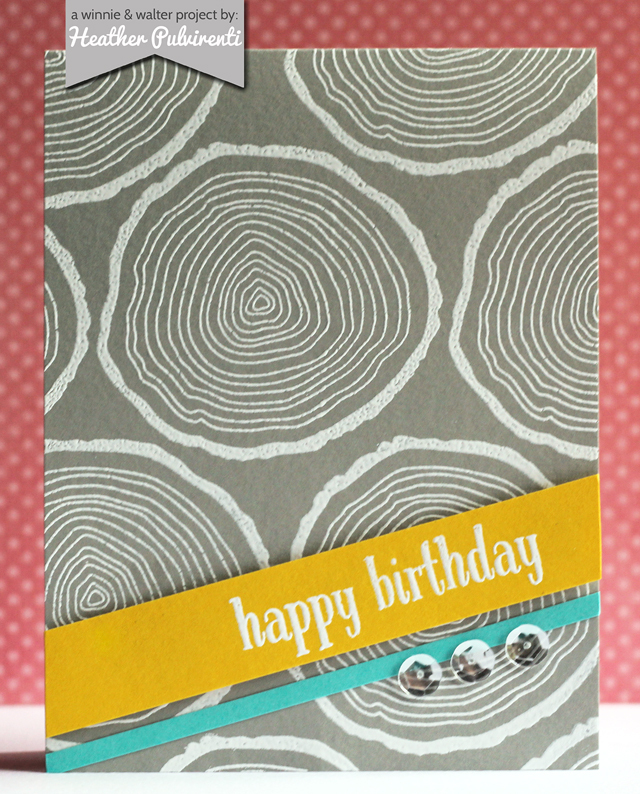 Love love love the trees and bark stamps! This release is probably one of my favorites. I really love the image of the cut log and the trees and all the elements go together so well for beautiful scenes! The long wait for this release was worth it - so many lovely ideas here, and I can't wait to see the full reveal of the stamps and new goodies. Winter Wonderland is tops on my list so far! Oh, I cannot wait for these new products to be released! I am loving EVERYTHING I've seen today! Fabulous new release!!! Love allof the projects from the DT! These stamps sets are truly amazing! I like the way each designer used them in different ways. I really like the blue skies, snow, and the deer in the foreground. Love, love, love these cards! OMG this release is W&W's best yet! Tht deer is awesome! So many cool stamp images that I love! I love the woodgrain! 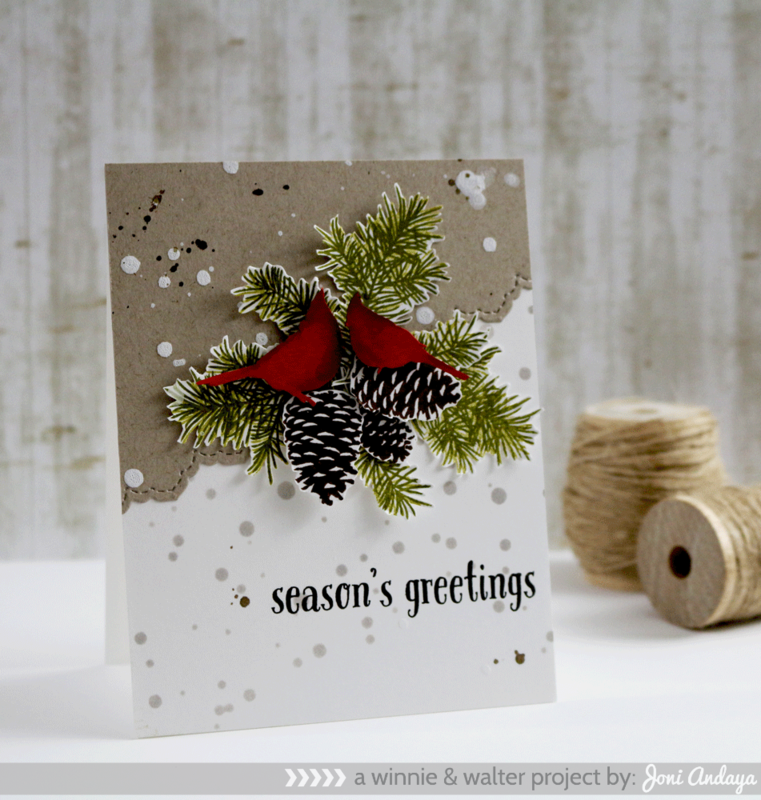 Another fabulous stamp set W&W! 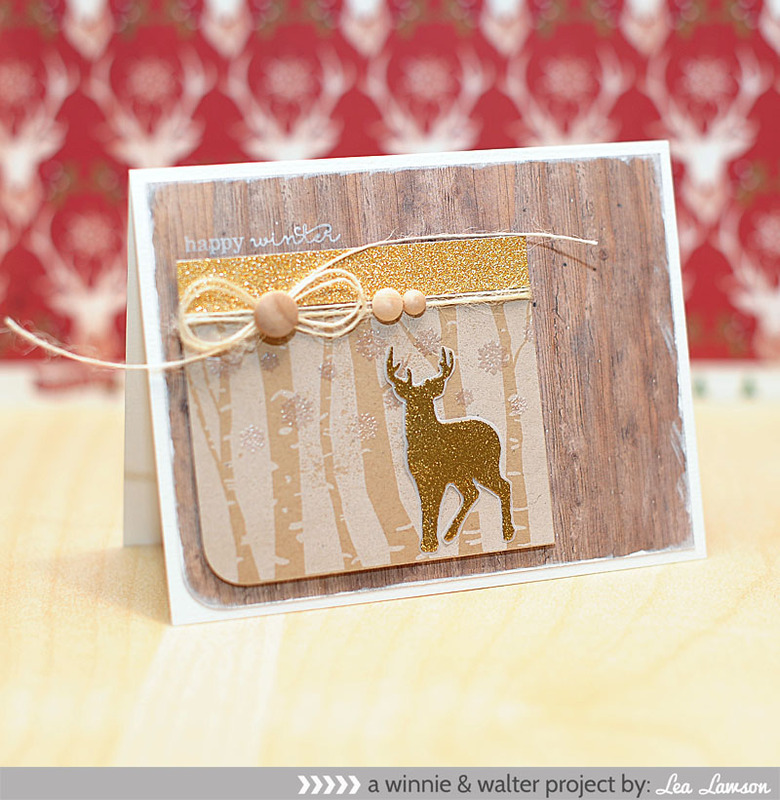 Love the woodland theme, and this is no exception! TFS! all this cards are so beauitful, and the backgrounds amazing! 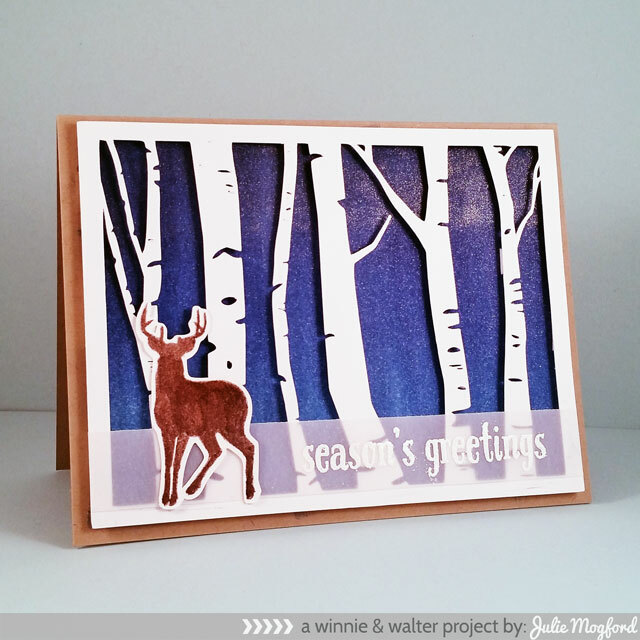 Love the birch trees and deer! Another set of great cards! What Gorgeous Creations! I love how differently each DT member has showcased the same sets! These sets are wonderful! Each of the projects shown are great! Deers and trees….what's not to love! Good stuff guys, good stuff! Great cards from the DT! These are awesome new sets....must haves! Winter woodland is a great set! Looking forward to the release!! Deer...trees...birch trees...oh be still my heart! LOVE these all!! !